Breakfast is not the biggest or most important meal of the day in Brazil. Brazilians tend to eat a lighter breakfast, as lunch (almoço) is usually substantial. The word for breakfast in Portuguese, café de monhã, translates literally to "morning coffee". Coffee is a very important part of the Brazilian breakfast. 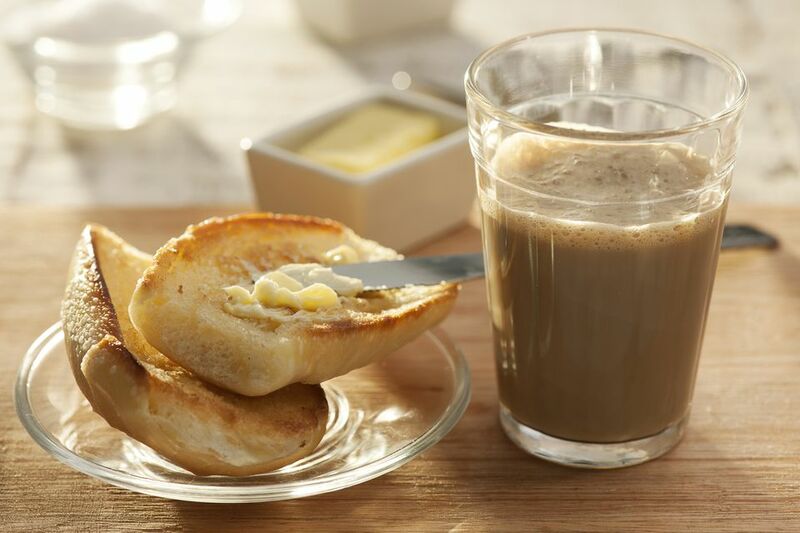 Many Brazilians enjoy pingado, or warm milk with sweetened coffee served in a glass. Skillet toasted French bread rolls (pão na chapa) is a favorite quick breakfast that you can buy at your local bakery and enjoy with pingado. Brazilians enjoy a wide variety of locally available tropical fruit, which is often served at breakfast, especially papaya. Many different fruit juices are available. Açaí is a dark purple berry that grows on a certain kind of palm tree and is thought to be especially nutritious. One very popular breakfast (especially at the beach) is a smoothie of frozen açaí, guaraná (another tropical fruit) syrup, and banana served in a bowl with granola and called açaí na tigela. Brazil's famous cheese rolls, pão de queijo, which are made with tapioca starch and happen to be gluten-free, are a popular breakfast choice. So are slices of cheese and ham, as well as grilled ham and cheese sandwiches (misto quente). One of my favorite things about breakfast in Brazil is that it's perfectly normal to have cake! Brazilians love cake, and there are many recipes for unfrosted simple tender pound cakes, typically baked in a ring pan. These cakes are very simple to make - the batter is often mixed up in a blender and poured into the pan. Orange cake is delicious for breakfast, as is cuca de banana (German-style banana coffee cake). Brazilians also enjoy lots of Portuguese-style sweetbreads. In Northeastern Brazil, steamed cornmeal called is a breakfast staple, served with butter and cheese. Special "flaked" cornmeal (milharina) is cooked in a special pot called a cuscuzeira, which is similar to a Moroccan couscoussiere). Middle Eastern immigrants brought their culinary traditions with them to Brazil. Many of these dishes have become staples of Brazilian cuisine, with certain local modifications (such as cornmeal in place of actual couscous). Corn shows up at the breakfast table in other ways too, such as in this delicate cornmeal cake called bolo de fubá (fubá is cornmeal), or in a creamy cornbread/custard. Manioc, also known as yuca and cassava (and mandioca in Portuguese) is a key staple in Brazilian cuisine. Manioc starch, or tapioca starch, is extracted from the liquid that is pressed from the flesh of the tuber, and is used for baking and to make the ubiquitous cheese rolls mentioned above. Manioc starch is also used to make unusual and delicious crepes known simply as tapioca. The starch is moistened with water and sprinkled over a hot skillet, where it magically melts together to form a thin pancake. These crepes are filled with both sweet and savory fillings, such as cheese, condensed milk and coconut, fruit, and chocolate. Tapioca is a popular street food, but they are wonderful for breakfast and very quick to make.